It’s bad enough that people posting regular news headlines on Twitter (s twtr) or Facebook (s fb) routinely need to mention that they aren’t from the parody site The Onion, because they seem too incredible and/or stupid to be true. On top of that, many people seem more than happy to share “viral” headlines on social media without even checking to see whether they are factual or not. Now The Onion has made our jobs as social-news consumers even harder by starting a site that specializes in making fun of this kind of viral clickbait, called Clickhole, which launched on Thursday. Although the site doesn’t mention them by name, Clickhole looks and feels like a combination of BuzzFeed and a low-rent version of ViralNova or dozens of other similar sites, which appear to exist only to get as many people to share their content as possible, so that they can monetize the clicks through Google ads. And there’s no question that these sites deserve to be satirized, as much or more than CNN. What makes the Onion’s satire even more delicious — or disturbing, depending on how you look at it — is that Clickhole appears to be monetizing itself using the exact same strategy as its targets are: The site has a number of clever banner ads for things like beef jerky, and it’s going to have native advertising as well. It’s just that the content surrounding them is (theoretically) satire. And, of course, The Onion is a media entity struggling to make its way in this new digital world just like any other, satire or not. Is it satire, or just clickable content?
. 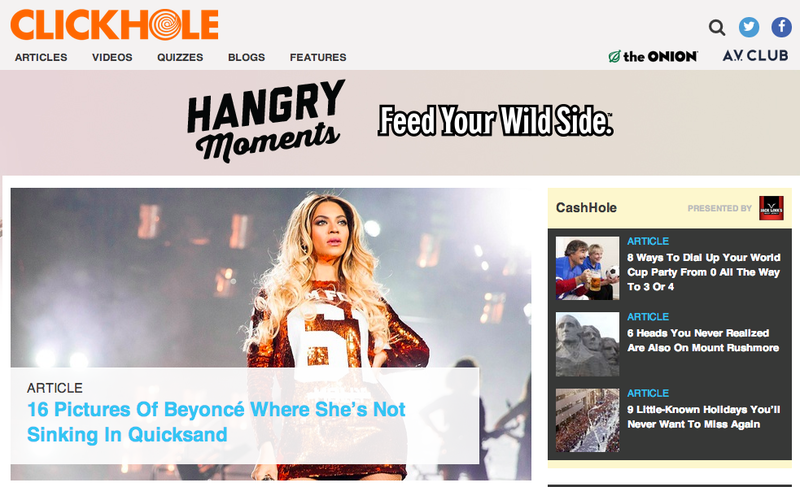 @ClickHole (made by @TheOnion) Top story right now: "16 Pictures Of Beyoncé Where She’s Not Sinking In Quicksand." Satire or cashing in? Some articles dance so close to the edge of satire that you could see them being shared by people without any realization that they are supposed to be a parody, or that they are making fun of the person sharing them — like the piece “5 Iconic Movie Scenes That Were Actually Fake,” which tries to point out (fairly subtly) that all movie scenes are fake because movies themselves are fake, so the guy playing a homicidal killer in Pulp Fiction is not actually a homicidal killer, etc. And from The Onion’s point of view, if these are shared by people who don’t realize they are parodies, that actually makes the satire even sweeter. In a similar way, The Onion as a business wins no matter what: Either its satirical pieces are so funny and on-point that they expand the company’s audience and it gets a reputation for great satirical click-bait, or the exact opposite happens and people share the site’s content without even knowing whether it’s satire or not — at which point it benefits from the same viral click-related advertising that it is supposedly making fun of. It’s pretty genius actually, when you think about it. this article, of course, is just the type of well-written yet nonsensical click bait that ClickHole.com is satirizing. Why can’t we tell if it’s irony or not? Because it’s too close to what passes for journalism these days. Stories where truth is optional. The way I see it, they took the next step in serious journalism. It’s called anti-humor. Apparently it’s not for people like you.